ASC Solar Water 2-tier Tulip Fountain with Battery/Timer and LED Light (3 Watt Solar Pump Kit) | Fountain City Art Ctr. 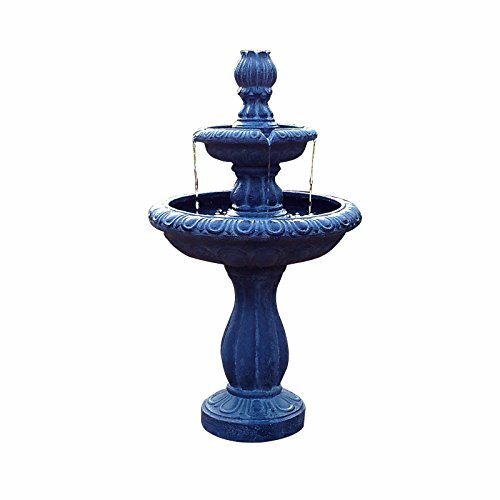 Are you looking for a traditional water fountain for your backyard or patio? If you are then this dark grey water fountain is the perfect option to decorate any area that you may have in mind. There are gentle curves along the two tier tulip solar fountain and elaborate swirls on each tier as well. Please note that the color may vary slightly depending on lighting conditions or computer monitor resolutions. This means that they might appear slightly lighter or darker then they are. Having a fountain that is solar powered is perfect for those areas that are not located near a power source. They are also the best option for homeowners that are looking to go green or if you are just looking to save a little on your energy bill. If you have any questions about this product by All Solar Central, contact us by completing and submitting the form below. If you are looking for a specif part number, please include it with your message.